Bill Gates, the man who got RICH in the 80's, got RICHER in the late 80's and became RICHEST man in the 90's. He is currently the wealthiest man in the face of the earth. As a matter of fact he has been the richest man as far as my memory lane goes. A business magnate, investor, author and a philanthropist. We all know about his story and how he became the richest man in world, the legacy of Microsoft and all those things. But today we are not here to see about how he got here, rather we are going to see about how he manages to stay on top of the list of the wealthiest people in the world. The year was 1987 and Gates was listed for the first time as a billionaire in Forbes magazine's 400 Richest People in America issue, just days before his 32nd birthday. As the world's youngest self-made billionaire, he was worth $1.25 billion in 1987, over $900 million more than he'd been worth the year before, when he'd debuted on the list. Well, we all know that obviously he got all those money from Microsoft's software products and the trademark OS, Windows. But it did not stay that way for ever. Bill started investing in many other top companies so that he can have a "bite from everyone's cookie". Quickly Bill Gates was termed as the richest person in the world and he was recognized by Time magazine which named Gates one of the 100 people who most influenced the 20th century, as well as one of the 100 most influential people of 2004, 2005, and 2006. Finally after 33 years Bill Gates attended his last full-time day at Microsoft on June 27, 2008. 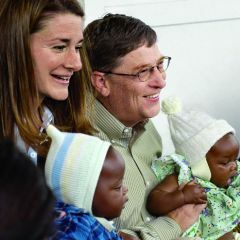 Bill Gates announced publicly that he along with his wife Mellinda Gates is going to commit the rest of their lives for helping many backward countries to fight against poverty, diseases like malaria, polio, AIDS and also help them by providing with infrastructure for education through the organization Bill & Mellinda Gates Foundation. This couple had given away aa whopping $38 Billion for their philanthropic cause as of 2016 and they are not planning on stopping to do what they are doing any time in near future. But the real question is how does Bill Gates still manages to stay on top of the Forbes list of billionaires, inspite of giving away such a humongous amount of his wealth for a greater cause? As of 2016 Bill Gates is estimated to own $81.7 Billion. As mentioned earlier, Bill Gates moved his cards brilliantly and invested in many other firms so that he can have a cut from other company's income too. But it would be difficult to invest smartly without expert knowledge about the market trends. So 20 years ago Bill Gates decided to hire a guy named Michael Larson to manage his investments in other firms. Since then, it has been Michael Larson who has been playing Bill's cards for him and making him a lot of money; and by lot I mean A LOT!! Larson runs Gates' personal investment company Cascade Investment LLC, funded solely by Gates. Bill Gates hired Larson, when his net worth was a relatively paltry $5 billion. Many people has a preconception that Gates's wealth solely depends on his income from Microsoft. Even though the majority of his income is indeed coming from Microsoft, it is definitely not dependent on it. Michael Larson has invested Bill's money in so many different firms and corporations and diversified his money. Gates now has vast holdings in real estate and non-tech companies like the Canadian National Railway Co., AutoNation Inc., and Republic Services Inc. It is these vast holdings that helps fund the Gates' donations. In simple terms Michael Larson is like Gates's magical piggy bank in which Gates puts few quarters in the night and finds a fist full of dollars in the morning. Michael Larson is investing Bill's money so smartly that even after donating an astounding amount of $38 Billion to charity, Bill is earning more money faster than he could spend. But what comes as a surprise is that the business relationship between Bill Gates and Michael Larson has always been ferociously secretive. These two do not hangout with each other much and they also don't act like buddies when they come face to face. They have been maintaining their relationship completely official. In fact Michael Larson is nicknamed as the "Gateskeeper" :P. Its a funny fact that even though many companies reveal that Cascade LLC has invested heavily in them, Larson has few tricks up his sleeves to make sure that Bill's name does not get publicized anywhere and manages to keep it all undercover. For instance, he makes employees sign confidentiality agreements or non disclosure agreements which cover them even after they leave Cascade. He farms out more than $10 billion to up to 25 outside money managers. This helps him find new investment ideas, but it also helps cover the trail so that it does not directly refer to Gates. When Cascade was part of an investment group that bought the Ritz-Carlton hotel in San Francisco, the publicist didn't even know Cascade, and Bill Gates, was among them. And he's frugal with the bosses money, too. Apparently Cascade employees, are not allowed to stay at the Four Seasons (one of the hotels in which Cascade has invested heavily on.) when traveling on business, even if that business is on behalf of the Four Seasons. They must choose a lower-cost, less luxurious hotel. Lately, Bill Gates threw a party to honor Michael Larson's contribution in which Bill stated that "Melinda and I are free to pursue our vision of a healthier and better-educated world because of what Michael has done". The bottom line is Bill Gates is still rich and rich he will be, for many more years to come with people like Michael Larson in his team. His $81.7 billion is nearly $6 billion more than it was as of March 2014, when he was worth $76 billion. And $76 was $9 billion more than he was worth in March, 2013. At the party, Gates told guests that he has "complete trust and faith" in Larson. But the real question is why does he have to be so secretive about is investments through Cascade? Well I definitely don't know the answer for that one. But my guess is, that Larson is trying to maintain a low profile for Bill Gates and his money so that it might look like Michael Larson is the true authority for the money he invests which in turns helps Gates to peacefully concentrate on saving the world from deadly diseases. Well, I can clearly sense whats there in your mind right now. Wish we all had an investor like Michael Larson on our side.